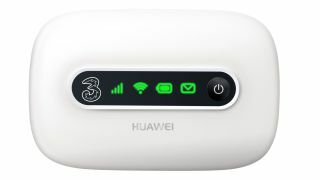 Three, have launched their low-cost value MiFi solution the Huawei E5331 for a one-off upfront cost of £29.99 on a one-month rolling contract with 5Gb of data a month for £15.99 per month, or at £49.99 on Pay As You Go with 1GB of data. As we reported last month the new Huawei E5331 Value MiFi will allow businesses to connect up to five Wi-Fi enabled devices, including tablets, laptops, to the internet and would make the ideal connection device for start up business or as a backup internet device for a small business. The value MiFi is described as "simple to use" and has just one button to switch on the device, with a basic LED screen displaying key information including signal strength and battery life. We would give you a link to the device but as yet Three haven't put it on their web site yet.